One thing I absolutely cannot stand is lag when I'm gaming. Every time I'm about to beat my killstreak record on Call of Duty, my internet connection drops and I'm a goner. It never fails. 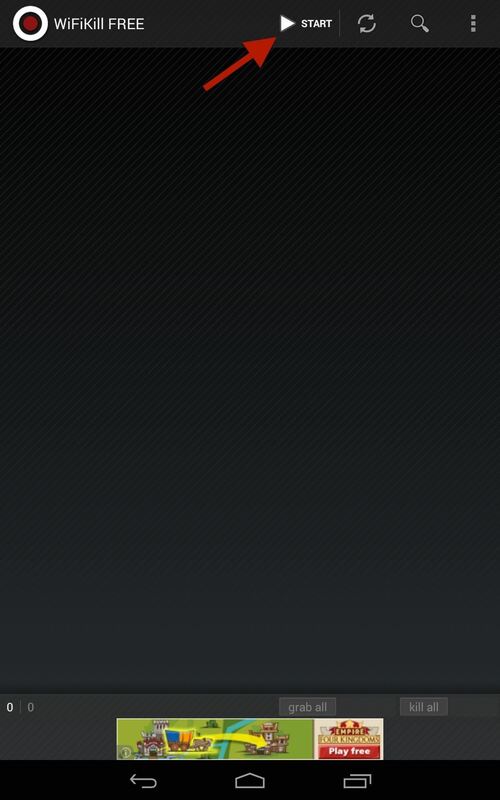 This usually happens because someone else on my Wi-Fi is streaming a movie or downloading a huge file. Yes, I could log in to my router from my computer and kick off everyone on my Wi-Fi, but that's too time-consuming, and what if I'm not on my own personal network? Thanks to my Nexus 7 and an app called WiFiKill by developer Bartosz Ponurkiewicz, creator of the famed FaceNiff app, there is an easier and faster way. WiFiKill lets you easily give people a "timeout" by kicking them off the network temporarily, and it's helpful for more than just games (e.g. Netflix streaming quality) and for more than just your own network. In order to acquire this app, you will need a rooted Nexus 7 or other rooted device running Android 4.0 or higher. 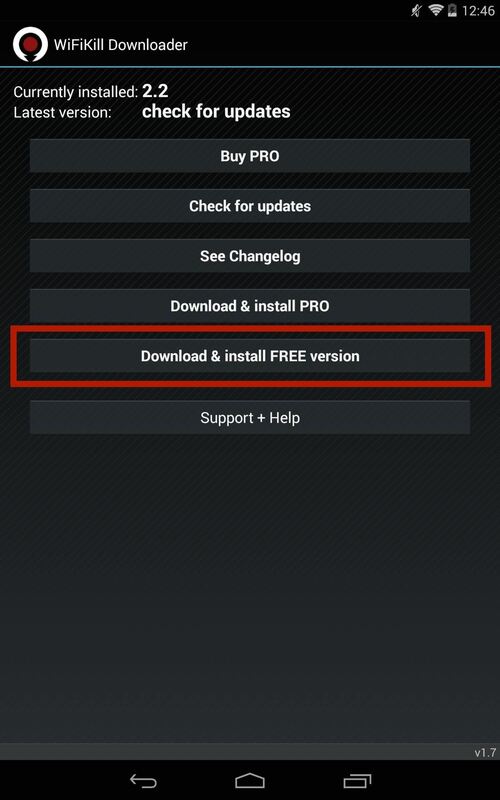 You will also need the WiFiKill Downloader app, which lets you install different versions of WiFiKill, check for updates, and view the changelog. 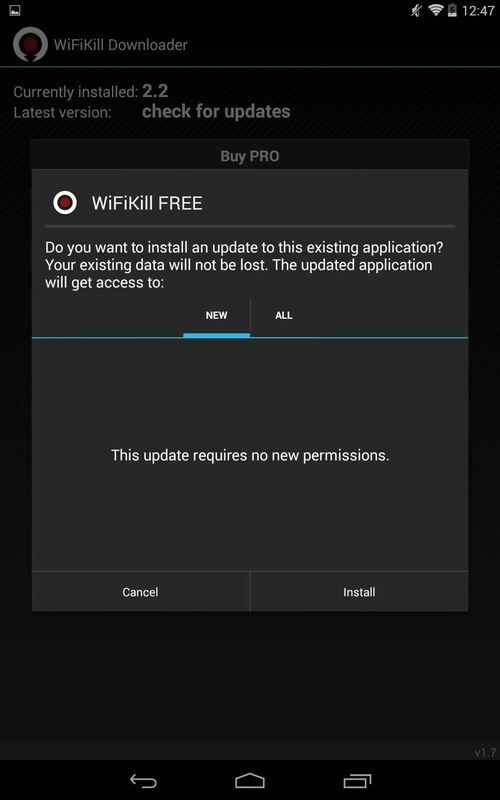 Once you have the Downloader app installed, open it up and select Download & install FREE version to test out the free version of WiFiKill. The free version has ads and lasts for only five minutes (hence the "timeout"), but that should be long enough for people to quit their attempts of reconnecting. The paid version is $6.00, removes ads, and disables Wi-Fi for any amount of time, which could be more helpful when you're on a public Wi-Fi network. When you first open the app, you'll be presented with a list of devices connected to your network and their IP addresses once you hit the Start button up top. Some of these addresses will have a vendor name next to them (i.e. "Apple, Inc."), but others won't. To weed out your own devices, you can just find out your IP address in your Wi-Fi or Internet settings on the device. It'll most likely be easier with your home Wi-Fi network, as you'll have fewer devices attached (I'm using my work network as an example). Once you've identified your own device (or a bandwidth hog), go ahead and label it for easy finding next time round. 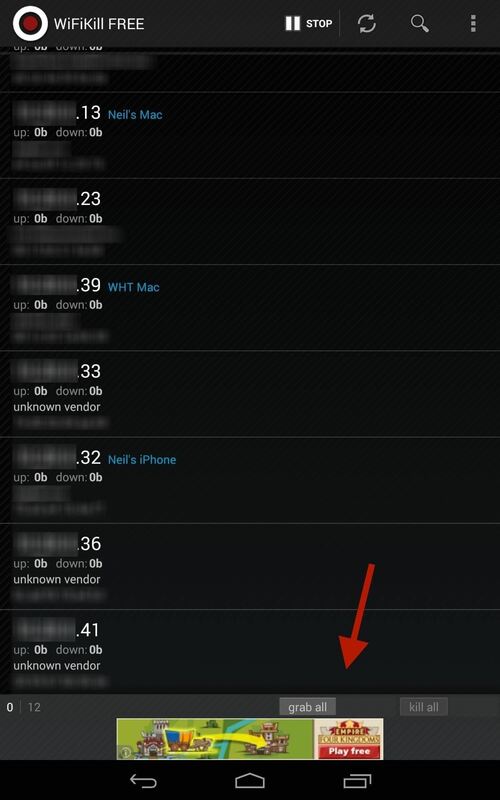 Tap on the IP address, then input the name where it says device name. At the bottom of the page, select grab all then kill all if you want to kick everyone off Wi-Fi right off the bat. By grabbing a device, you will be able to view traffic and recently visited websites. Obviously, grabbing all will also kick you off whatever other devices you're using (e.g. Xbox, PlayStation, computer, etc. ), so I recommend doing it on a case-by-case basis (see next step). Kicking everyone off at once could raise suspicions, especially if you're the only one left with a working connection. 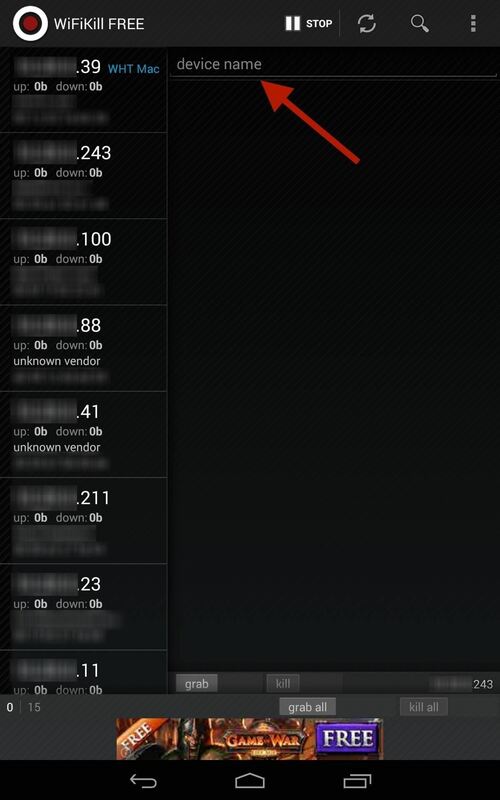 Instead, kick off the bandwidth hogs on an individual level by selecting their device(s), selecting grab, then kill. This process can seem diabolical, but some of us will go through great lengths to have the internet all to ourselves. Enjoy it for free, or upgrade to unleash its full capability. And yes, you can use this in some of the more open public Wi-Fi hotspots (these days, most public ones are protected from these types of antics) and kick people off, but just remember to disable the application before you leave.